The mechanical model 212.20 Bourdon tube pressure gauge is constructed with a case from stainless steel and wetted parts from copper alloy. 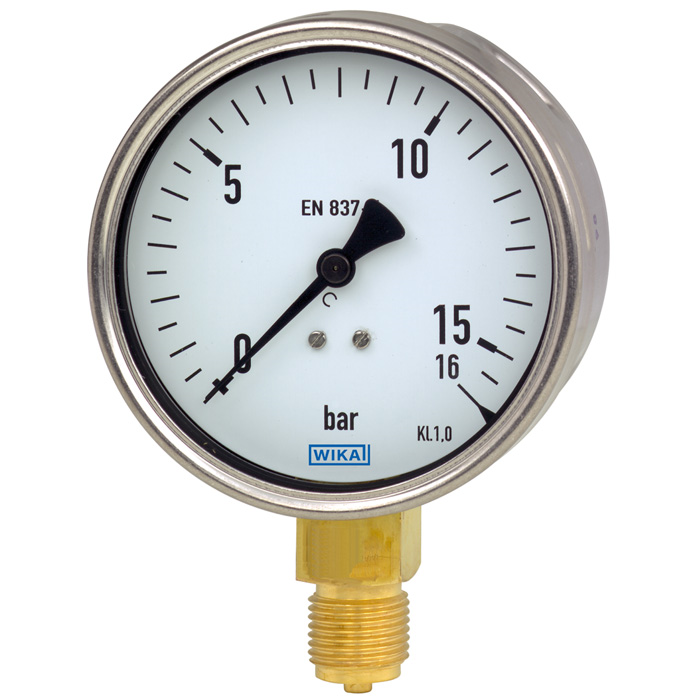 The model 212.20 meets the requirements of the international industry standard EN 837-1 for Bourdon tube pressure gauges. Frequent measuring points are found in the machine building, plant construction and building services industries. The model 212.20 can also be used in refrigeration applications. The cases are available in nominal sizes of 100 and 160 mm and fulfil IP54 ingress protection. With an accuracy class of 1.0, this pressure gauge is suitable for the process industry. The modular design enables a multitude of combinations of process connections, nominal sizes and scale ranges. This high variance enables universal use of the instrument in the industrial sector. For mounting in control panels, the pressure gauges can be fitted with a mounting flange or with a triangular bezel and mounting bracket.